A project budget planner template is an essential part of virtually any business because it helps to keep track of various aspects such as the total amount of hours spent working on the project and total costs of different aspects of the project itself. 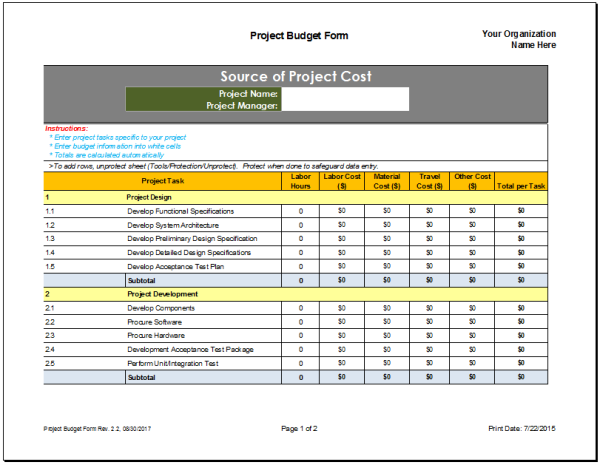 The kind of project budget planner template to be reviewed is one that can be edited easily depending on the project, as well as the overall needs and/or wants of your particular business. The top of the template lists your name, followed by the name of your business or organization. Next is listed both the name of the project and the project manager, followed by two separate sections involving project design and project development, which is where information such as labor hours and costs for various aspects of the project will be listed. All in all, this particular template is one that is simple enough to use for any type of project for your business.